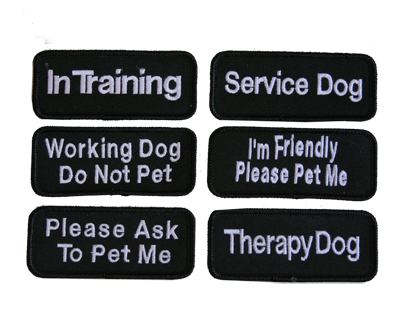 These patches are designed for the Tiny Dog Vest. They are a heavy twill, black patch with white embroidered lettering. The edges are finished and bound with black thread. We use polyester, high sheen, embroidery threads for the lettering. ALL patches are now 1.5" x 3.5"